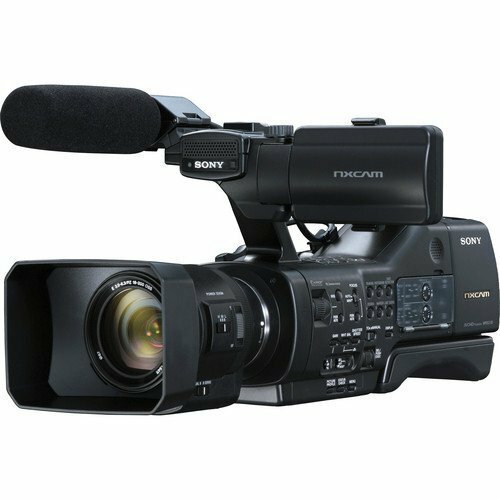 Hybrid Camera Revolution: Pro large sensor, interchangeable lens Sony NEX-EA50 shoulder mount camcorder now costs less than a Handycam! Pro large sensor, interchangeable lens Sony NEX-EA50 shoulder mount camcorder now costs less than a Handycam! You can now pick up a sale-priced Sony NEX-EA50UH professional APS-C interchangeable lens camcorder with a shoulder mount, a 18-200mm power zoom lens and XLR mic inputs for $2299 - less than the cost of the NEX-VG30 Handycam with the same lens and a 3.5mm consumer mic input. If you're an NEX shooter who wants to upgrade to a professional large sensor camcorder, but who doesn't need 4K, this deal may be for you.